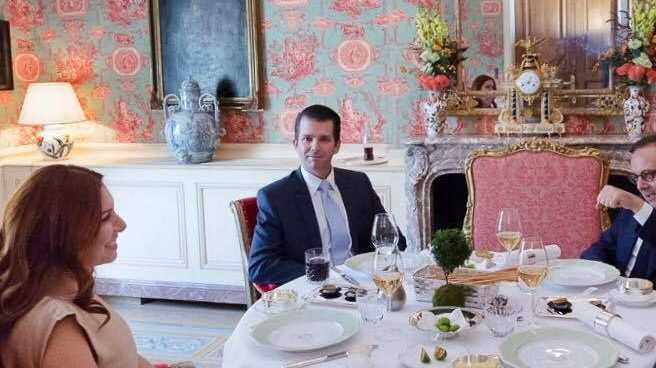 Donald Trump's eldest son held talks in Paris about collaborating with Russia to end the Syrian conflict - the latest indication of both the President-elect's likelihood to work with Moscow, and of the way he may include family members as part of his administration. Donald Trump Jr, 38, participated in discussions last month, that included think-tank founder Fabien Baussart and his wife, Randa Kassis. The Wall Street Journal said Ms Kassis is a leader of a Syrian opposition group that is backed by the Kremlin. While the US has opposed Syrian President Bashar al-Assad and has funded rebels opposed to him, Russia has used its military force to protect his regime and attack rival opposition groups. Ms Kassis' group reportedly seeks a political transition through cooperation with Mr Assad. "Russia intervened to save the country, for the sake of Syria," Ms Kassis told Al-Jazeera this week. "The problem is that you don't know the Russians, you don't understand the Russians... You just accuse the Russians of being against the opposition but you need to understand them." The meeting at the Paris Ritz was held on 11 October. Reports said Ms Kassis is reportedly viewed as pro-regime because she advocates political transition in cooperation with Mr Assad, and because of her strong support of Russian intervention. Ms Kassis told the paper from Moscow: "We have to be realistic. Who's on the ground in Syria? Not the US, not France. Without Russia, we can't have any solution in Syria." Of the President-elect's eldest son, she said: "I think he's very pragmatic and is flexible." This week, Mr Trump went off-the-record with reporters from the New York Times to discuss his views on the Syria conflict. "I can only say this: we have to end that craziness that's going on in Syria," Mr Trump said. Of his views on Russia, Mr Trump told the newspaper that he would "love to be able to get along with Russia and I think they'd like to be able to get along with us". "It's in our mutual interest," he added. Ms Kassis wrote about the Paris meeting on her Facebook page two weeks ago and posted images from the event. "Syria's opposition got hope that political process will move forward and Russia and the United States will reach accord on the issue of the Syrian crisis, because of Trump's victory," she said. "Such hope and belief is the result of my personal meeting with Donald Trump Junior in Paris in October." In addition to reinforcing President-elect Trump's frequent statements of support for Russia and Russian President Vladimir Putin, the meeting signals the wide-ranging portfolios Trump family members have carved out. Mr Trump told the New York Times on Tuesday that son-in-law Jared Kushner could help make peace between Israel and the Palestinians, when asked a question about Mr Kushner's role. "I would love to be able to be the one that made peace with Israel and the Palestinians. "I would love that, that would be such a great achievement. Because nobody's been able to do it," Mr Trump said.